Lean Manufacturing PDF Lean Manufacturing PDF Value Stream Mapping best practice are treated in this page. Following this guide you will be very effective in Value Stream Mapping. Reading this page you will know everything about the Value Stream Mapping. I selected for you the best materials, Lean PDF, Lean Manufacturing Video and best posts. Probably the longest web guide ever was written. Value stream mapping is a lean management principle. It is used to analyze and design the flow of materials and information required to bring a product or service to a consumer. This map has to be considered the blueprint of "the best in class manufacturing" you want to build. It is important, prior to startimg with VSM, to define the Products Family. There is a quite standard method to draw a value stream map and there is a rigorous path to follow to be efficient in doing it. There is no point to do a Value Stream Map without a WHY! when the purpose is set and shared among leadership is time to map. An (almost) standardized way is used. Here you will find the tips to be effective and efficient during the mapping. The list of materials you need prior to starting. will be there looking each other and wasting time. At least 20-30 A3 size papers and Makers as you can. Pens, Pencils, Highlighters etc. About the colours stay in 3-4 (i.e. Black, Red, Green). Everybody could write. What I find annoying is when there is no a place to write in a comfortable way. You can use your mobile for sure. But I would like to suggest the old and good calculator. Value Stream Mapping is a handy activity but why do not try to draw in a more technical way. It is important to map with the people involved in the product family. I would like to suggest from 3 to 7 of different departments. If you want not to waste time set the hour of beginning and duration of this activity. You can start and stop on different days, too. Each step no more than 5-10 minutes of discussion/observation. It is important the every participant is engaged and give his contribution. You can download a Lean Manufacturing PDF on Value Stream Mapping. because the consultant did not explain me correctly how to do a Value Stream Map. I will treat in points with an explanation. Each point is a Pitfall. VSM on PC is a mistake. If you do on PC there is no collaboration. You do not see what really happens. You can lose the last edition of the file. You have to map a product family. If you map just one product you can address people on that product and let the others slow down. There is no point with that. Consider the VSM as a short term cost reduction. With the Value Stream Map you will assess where the opportunities are. The key point is the to be, where the organization would evolve to give customer better experience. 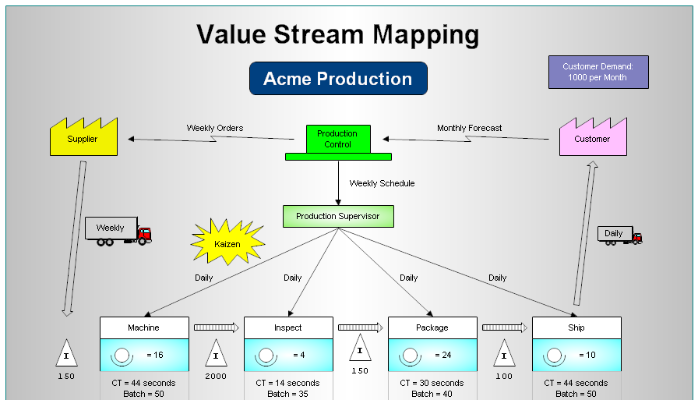 How many types of Value Stream Map exist? you have to focus on the problem and then decide what you have to map. Please never never never forget why you map. You have to carefully details what is going on in a single process. You have to map a value stream from raw material to shipment. You have to map the value stream out of your company towards supplier and customers. there are described the 8 steps to Value Stream Mapping. I spent a lot of time to select the best videos for you. Why do not you give me satisfaction by sharing with friends? It is a second for you and great value for me! Here what Deming defined as general flow in an industry. 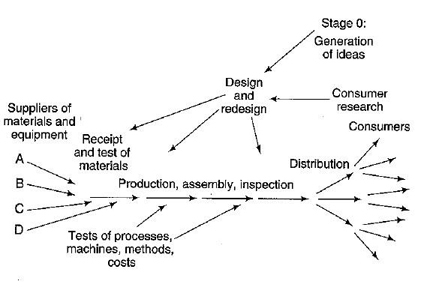 To the make the flow diagram work, the flow of material and information from any part of the system must match the input requirements of the next stages. Thus, the aim in the flow diagram is for the material to come in at the front, and to emerge at the end as usable product or service. The flow diagram describes not only the flow of material, but also the flow of information needed to manage the system. Source – “The New Economics For Industry, Government, Education” by Dr. Deming. Here a very interesting article from Harish Jose on the Value Stream Mapping. VSM - Another Point of view. Lean is a journey that never ends. 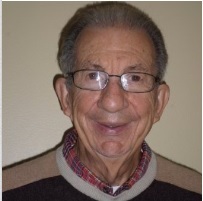 is one of the most important concepts of Lean Manufacturing. to improve throughput to the customer. and analyzing all steps and identifying the wastes associated with each step. a value adding analysis is done to calculate the % of value added activities. most businesses will have a value add % of below 5 %. depending on your particular industry. as the efforts which were wasted earlier will be used for adding value. A Value Stream is defined as the set of all actions (both value added and non value added) required in bringing a specific product or service from raw material to the customer. A Lean cross-functional team creates the best VSM. the same sequence of operations and the same resources. It is simple. It costs almost anything. And will give you results. With a Value Stream Map you can destroy the barriers among departments. When everybody is oriented towards the flow, the customer and the company win. Now I would like to suggest you to subscribe our newsletter to be always updated. The video you cannot miss!